Another conservative senator has declared he would cross the floor in support of a bill to water down the Racial Discrimination Act, invoking Prime Minister Malcolm Turnbull’s own words to justify his rebellion. This means more than half a dozen government senators would now cross the floor should the issue come to a vote. Liberal senator Zed Seselja told the Senate on Thursday that the current act, which makes it an offence to “insult” or “offend” someone on the basis of their race, was too subjective for a court to decide. Conservative columnist Andrew Bolt was found to have breached the act in 2011. A compromise bill has been put forward by Family First senator Bob Day after the Coalition dumped its own promise to repeal section 18C of the act. The compromise would make it no longer an offence to offend or insult a person on the basis of their race. It would remain unlawful to humiliate or intimidate a person or group of people based on their race or ethnicity. 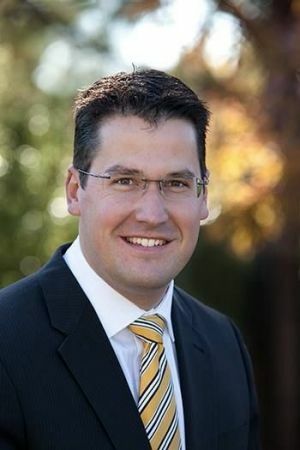 “When Senator Day proposed an alternative compromise for reform of the act that simply struck out the words ‘insult’ and ‘offend’ the then communications minister, now Prime Minister Turnbull, said he was ‘very comfortable’ with the proposal and did not foresee ‘any negative impact’,” Senator Seselja said. Senator Seselja noted Mr Turnbull has previously said changing the act must be done “delicately” and “you’ve got to bring people along with you”. “Well I believe the time to bring people along is now,” Senator Seselja said. He added that, despite the government’s decision to set the issue to one side under the leadership of former prime minister Tony Abbott, it was important to stick to the Coalition’s pre-election promise to repeal section 18C of the act. Senator Seselja’s intervention sees him join fellow Liberals Cory Bernardi, Dean Smith, Linda Reynolds, Chris Back and Ian Macdonald in declaring they would back the compromise bill. Mr Turnbull’s assistant minister and numbers man, senator James McGrath, had told the Young Liberals he would also cross the floor but has retreated from his strident stance since being elected to the frontbench. Crossing the floor would mean giving up his ministerial position. A vote is unlikely to occur after Mr Turnbull asked Senator Day to delay any vote. A senior government source confirmed the Coalition would not revisit the issue, citing the need to keep the Muslim community on-side during the heightened national security environment. Labor senator Lisa Singh called on Mr Turnbull to declare his position publicly. “We’ve had silence, we’ve had absolute silence from the Prime Minister,” she said. “So who is to know where this government stands? You are completely divided on this, completely divided,” Senator Singh told government senators. Senator Macdonald confirmed his support for the bill and said it was right that it should remain an offence to humiliate and intimidate a person based on their race. Senator Back also spoke in favour of the proposal and described the act in its current form as a “grotesque limitation on political discourse”. Labor senator Jenny McAllister called on Liberals backing change to provide a list of the insults and offences they want people to be allowed to say if the law is changed.